I’m excited to offer you this ensemble of vibrational medicine and an easy, enjoyable one month practice to bring you into harmony with nature. You are the love you’ve been waiting for and the medicine the world needs to wake to love. Break free from judgement and anxiety. Harness your heart power to awaken,shine and free your joy. Wild Woman is calling you to awaken to love, come home to your body, free your voice and the wild power of love to flow through you. 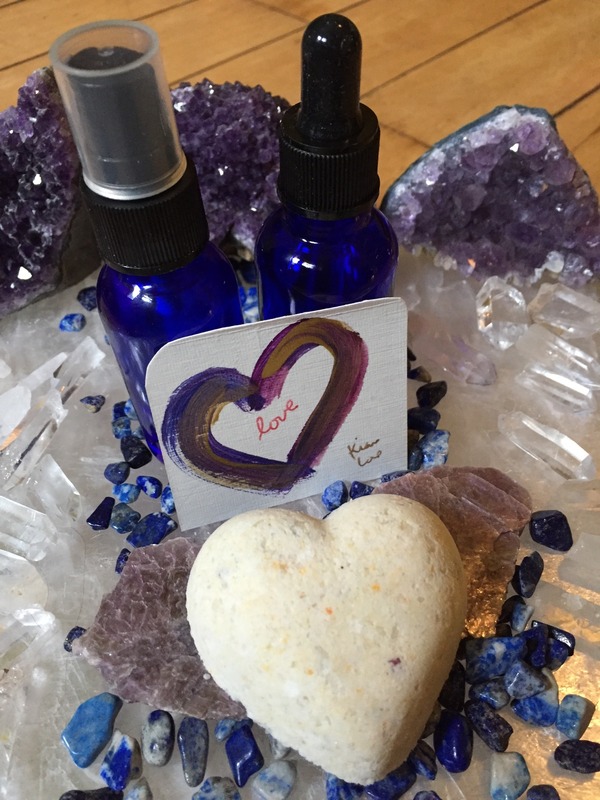 One on one 60 minute healing session with Kiana Love to attune you to receive this healing ensemble, attune the ensemble for you and instruct you on how to best use it. This is a personal energy healing calibration to root, realign, balance and bring you into resonance with nature. This is to be scheduled upon purchase (via video call, phone or live). This sacred ritual awakens you to receiving love and sets your heart’s sacred desire free. Vision, manifest and luxuriate in love. Light a candle, put music on, awaken your senses and soak in love. This works at a heart level from the inside out to empower you to root and awaken to love…to feel loved, accepted, free to love, and to fall in love with life. It works to clear old painful patterns. And reconnects you with your true love nature. Recover your innocence, joy of life, pleasure and connection to the unstoppable power of love. This works at a global level to awaken you to the world around you and the world around you to you with love. Works to clear the cobwebs of fogginess, checking out and overwhelm and allows you to begin to see, feel and experience life through love’s lens. Use this to clear your physical space, your body and to feel supported in the world. Rose water, Amma water (from Ammachi water puja), Arkansas crystal water. Delight your body with healing sound, sensuous rhythms, guided relaxation, visualization and movement. Bliss your body, dance, awaken to love and love being wild. Kiana Love, founder of Be Wild Woman, guides you on an audio journey into the bliss of love with the healing energy of Wild Woman. This is an invitation to awaken your intuition, gratitude, trust, awareness, expression and wild joy. It is an opportunity to break free from trauma, judgement and blocks to you saying yes to your life. Channelled energy healing art message from Wild Woman through Kiana Love. Reconnect with nature and remember that you and your heart are wild. Use this healing art painting to meditate, awaken and free your heart. Located on the Upper West Side of NYC, Be Wild Woman reconnects women with the joy of their own wild feminine nature so they can feel at home in their bodies, safe, empowered and loved. Be Wild Woman specializes in women’s recovery from trauma. Wild Woman Healer Kiana Love is passionate about helping women love their bodies and themselves. She drew from her own healing journey, experience in supporting women and from Wild Woman, nature herself to create her Wild Woman Awakes program to support and empower women on their healing journeys. She created her program to help women reclaim their bodies, self-love & joyful expression.